KEHOE TESTING & ENGINEERING, INC. (KTE) distinguishes itself from other “standard” drilling companies by specializing in direct push sampling & Cone Penetration Testing (CPT) for environmental & geotechnical projects. We work as a subcontractor to environmental consultants and geotechnical engineering firms. We do not provide any engineering or consulting services. Direct push sampling is a relatively fast & economical method for collecting samples (soil, groundwater, vapor) without generating soil cuttings unlike conventional hollow stem auger drilling. CPT provides a continuous soil profile log as well as strength parameters used for many geotechnical evaluations. 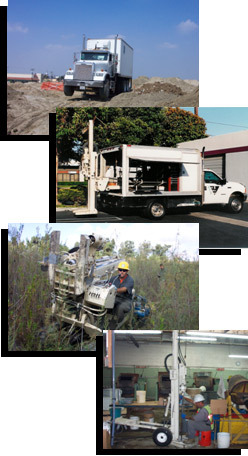 KTE has performed direct push sampling and CPT on thousands of sites throughout California since 1998. Our goal is to use our experience in helping clients use direct push & CPT to the fullest extent possible on their project. KTE operates 8 direct push rigs (5 truck mounted rigs, 1 track mounted rig, 3 limited access rigs) with capabilities to sample deeper than many conventional direct push rigs. Our limited access rigs are very portable for sampling inside buildings or tight access areas. We also operate three four-axle, 30-ton CPT rigs, which are heavier than most CPT rigs in the United States. Please call if you have questions whether direct push or CPT would be appropriate for your site.